Forrester’s forecast that Hadoop will become an “enterprise priority” in the next 12 months, International Data corp. has just gazed into its own crystal ball, and sees a future where spending on Big Data analytics is set to grow three times faster in 2015. Companies and organizations will struggle to find data engineers and data scientist talent. Many legacy ETL/Integration and EDW resources will fill the gap. While we can’t know for sure if each of these things will come true, we do know that the world of big data is changing. It’s no longer about just having access to data and the ability to store it, but instead the ability to achieve actionable results with data through predictive and prescriptive analytics. Only time will tell how this evolves, but if you aren’t leveraging data to compete and win, it’s time to get on board. The big data and analytics market will reach $125 billion worldwide in 2015, according to IDC and if you are not investing or planning to invest, you are already behind your competitor or losing your spot from being an A player. Addressing the big data security! Data Security rules have changed in the age of Big Data. The V-Force (Volume, Veracity and Variety) has changed the landscape for data processing and storage in many organizations. Organizations are collecting, analyzing, and making decisions based on analysis of massive amounts of data sets from various sources: web logs, click stream data and social media content to gain better insights about their customers. Their business and security in this process is becoming increasingly more important. IBM estimates that 90 percent of the data that now exists have been created in the past two years. A recent study conducted by Ponemon Institute LLC in May 2013 showed that average number of breached records was 23,647. German and US companies had the most costly data breaches ($199 and $188 per record, respectively). These countries also experienced the highest total cost (US at $5.4 million and Germany at $4.8 million). On average, Australian and US companies had data breaches that resulted in the greatest number of exposed or compromised records (34,249 and 28,765 records, respectively). A Forrester report, the “Future of Data Security and Privacy: Controlling Big Data”, observes that security professionals apply most controls at the very edges of the network. However, if attackers penetrate your perimeter, they will have full and unrestricted access to your big data. The report recommends placing controls as close as possible to the data store and the data itself, in order to create a more effective line of defense. Thus, if the priority is data security, then the cluster must be highly secured against attacks. What actions are company taking that creates trends that can be exploited by its rivals? Use Kerberos authentication for validating inter-service communicate and to validate application requests for MapReduce (MR) and similar functions. Use Automation tools like Chef and Puppet to help you validate nodes during deployment and stay on top of: patching, application configuration, updating the Hadoop stack, collecting trusted machine images, certificates and platform discrepancies. Create/ use log transactions, anomalies, and administrative activity to validate usage and provide forensic system logs. Use SSL or TLS network security to authenticate and ensure privacy of communications between nodes, name servers, and applications. Implement secure communication between nodes, and between nodes and applications. This requires an SSL/TLS implementation that actually protects all network communications rather than just a subset. Use Tokenization technique to protect sensitive data by replacing it with random tokens or alias values that mean nothing to someone who gains unauthorized access to this data. Use OS Hardening – the operating system on which the data is processed to harden and lock down data. The four main protection focus areas should be: users, permissions, services, logging. A study conducted by Voltage Security showed 76% of senior-level IT and security respondents are concerned about the inability to secure data across big data initiatives. The study further showed that more than half (56%) admitted that these security concerns have kept them from starting or finishing cloud or big data projects. The built-in Apache Hadoop security still has significant gaps for enterprise to leverage them as-is and to address them, multiple vendors of Hadoop distributions: Cloudera, Hortonworks, IBM and others have bolstered security in a few powerful ways. Cloudera’s Hadoop Distribution now offers Sentry, a new role-based security access control project that will enable companies to set rules for data access down to the level of servers, databases, tables, views and even portions of underlying files. RSA NetWitness and HP ArcSight ESM now serve as weapons against advanced persistent threats that can’t be stopped by traditional defenses such as firewalls or antivirus systems. 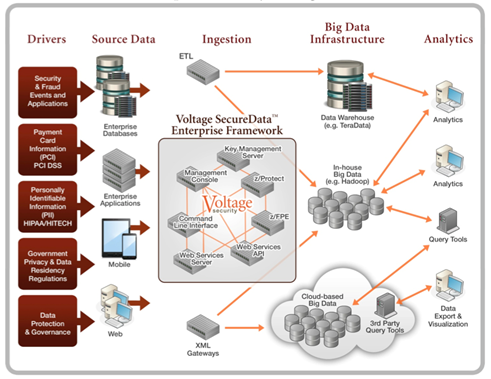 Hortonworks partner Voltage Security offers data protection solutions that protect data from any source in any format, before it enters Hadoop. Using Voltage Format-Preserving Encryption™ (FPE), structured, semi-structured or unstructured data can be encrypted at source and protected throughout the data life cycle, wherever it resides and however it is used. Protection travels with the data, eliminating security gaps in transmission into and out of Hadoop and other environments. FPE enables data de-identification to provide access to sensitive data while maintaining privacy and confidentiality for certain data fields such as social security numbers that need a degree of privacy while remaining in a format useful for analytics. First of all, although today the focus is on technology and technical security issues around big data — and they are important — big data security is not just a technical challenge. Many other domains are also involved, such as legal, privacy, operations, and staffing. Not all big data is created equal, and depending on the data security requirements and risk appetite/profile of an organization, different security controls for big data are required.